A gas pipeline network connecting Australia to China, Japan and South Korea would be cheaper and more efficient than environmentally-damaging Liquid Natural Gas (LNG) projects. Proposed and planned new gas pipelines in Asia are rapidly creating a network spanning the region. If interconnected, they would create a highly-efficient network. The misallocation of resources has been worst in Australia. There, roughly $150 billion has been invested in LNG. It has little prospect of either making money or lasting a full working lifespan. Carbon pricing, the termination of fossil fuel subsidies and the shift to renewable energy ensures most of this LNG investment will be written off prematurely. Measured by collective investment ($US150 billion), capacity (66 cbm/yr of natural gas) and distance from markets (8,000 km) Australia’s LNG projects stack up poorly as a capital allocation. A far better, long-term economic outcome could be achieved by a flexible, multi-fuel, common-carrier pipeline network of the same capacity. It would stretch from Australia to China, Japan and South Korea. It would be constructed to carry both natural gas and hydrogen. Hydrogen is tomorrow’s fuel. Natural gas isn’t. The benefits of such multifuel flexibility are compounded when the advantages of laying long distance power lines and fiber optics along the same routes are considered. A bundled infrastructure capable of carrying gas, electricity and data unlocks enormous efficiencies spanning the entire energy and data value chain. These range from upstream energy production through midstream energy transmission to downstream energy trading and consumption. Such a flexible, integrated, future-proof regional delivery network capable of carrying natural gas, hydrogen and electricity as well as data will increase regional supply security and reward political cooperation through the arbitration of markets and prices. The result: fewer investment misfires like LNG. With an integrated regional energy market in Asia solar, wind, nuclear or even coal-fired carbon capture and storage could properly compete on a level playing field arbitrated by price, distance, availability and carbon load. Bundled together, power lines and gas pipelines represent an immensely powerful energy infrastructure combination. In Asia they would follow the pathways already laid down by fiber optic cables over the last 20 years. The benefits of the data revolution to Asia have been indisputable. The global energy industry is a laggard. Worsening climate change has been the result. In coming years, the transition in Asia from capital-wasting, negative-value LNG to a more productive pipeline era will get underway. This will be enabled by — among others — catalytic investments made by China’s newly created Asian Infrastructure Investment Bank. In coming months, the AIIB is expected to announce its first loan. Its best choice would to fund the Association of Southeast Asian Nations (ASEAN) Trans-ASEAN Gas Pipeline (TAGP) project. The proposed $7 billion TAGP will more deeply integrate ASEAN’s natural gas markets through extending and deepening cross border natural gas pipeline links between the organization’s 10 members. This would create both upstream and downstream benefits. Downstream, it would ease the flow of natural gas from producing countries (such as Vietnam, the Philippines, Indonesia and Malaysia) to consuming countries. Upstream, it would open the way for China and her southeast Asian neighbors to negotiate Joint Development Areas (JDAs) in the politically-contested South China Sea. Under Joint Development Area agreements, contesting claimants to an offshore area freeze claims indefinitely while they cooperate to develop the resources within them. Final territorial determination is postponed until the stakes are lower. All countries support peaceful resolution of South China Sea offshore territorial claims. All countries support the concept of joint developments areas. Over time, the core TAGP network could be extended northward to China, Japan and South Korea and south to Indonesia, East Timor and Australia. The result would be Pan-Asian Gas Pipeline (PAGP) network that — properly constructed — would span the transition from dirty coal-fired power to medium-dirty natural gas to zero emission solar and wind energy transported to market either as electricity or hydrogen. The technology to do this already exists. Incorporated into pipeline specifications, the transition period from natural gas to hydrogen could be determined by market conditions. LNG offers no such potential, which is a major flaw. Omitting this from net present value calculations has resulted in misdirected investment and industry markdowns of LNG infrastructure value in Asia. Asia should heed the signal. Floating LNG: Asia’s Energy Boondoggle? Planned Floating Liquid Natural Gas (FLNG) projects in Asia raise hard questions about the technology’s suitability. These include unproven operational durability,1 questionable downstream efficiencies and potential ‘Tragedy of the Commons’ resource exploitation. Regionally-interconnected gas pipelines look like a much better long-term deal. An open-access, common-carrier natural gas pipeline network in Asia will prove a better deal than Floating Liquid Natural Gas for the region. Given that offshore gas pipelines and FLNG cost roughly the same, a better long-term investment for Asia would be an open-access, common-carrier cross-border gas pipeline network. Pipelines have a longer lifespan and greater flexibility than FLNG. Pipelines also offer valuable network economies. Most importantly, they can handle multiple fuels. FLNG, by contrast, can only carry natural gas between fixed locations using single-purpose infrastructure — a huge technological rigidity. This flexibility of pipelines will become increasingly apparent over time as Asia adopts policies to limit climate change, reduce geopolitical tension and enhance long-term economic growth through deepening regional market integration. As it happens, opposition to FLNG is beginning to emerge. China’s CNOOC is studying FLNG10 for developing gas fields in the South China Sea’s disputed waters for just that reason. CNOOC says FLNG avoids any need for regional land-based facilities. Any move by China to deploy FLNG in disputed waters is certain to raise geopolitical tension,11 particularly with the Philippines and Vietnam. These two countries also claim areas of the South China Sea likely to be targeted CNOOC. This occurs when unsettled resource property rights lead to conflict because ambiguous property rights favor ‘first movers’ who, in turn, have no incentive to develop the resource sustainably. Instead, ‘first movers’ have every incentive to develop the resource rapaciously, since waiting may require sharing it. A first step in this direction occurred earlier this year when China placed an exploratory rig in waters claimed by Vietnam,12 a move that sparked violent anti-Chinese protests in Vietnam. In both the South China Sea and Australia’s Northwest Shelf, large new gas supplies will be developed in coming decades. These are going to require large capital investment better directed to multi-purpose pipelines. In Australia’s Northwest Shelf a gas pipeline would enable aggregration of onshore and offshore natural gas supplies for delivery to Northeast Asia. This would create economies of scale for construction of a large, common-carrier, open-access natural gas pipeline system. This pipeline system could later offer a route to market for Timor Sea and Eastern Indonesian gas supplies. In the South China Sea, meanwhile, Joint Development Areas shared by China and her Southeast Asian neighbors could link into this larger, regional common-carrier, open-access gas delivery network. Both China and her neighbors already voiced support for Joint Development Areas as one way to peacefully manage conflicting territorial claims. Pipelines also would enable future development of new fuels like deep-sea methane hydrates,13 as well as create pathways for laying subsea High Voltage Direct Current power lines in the future. These would more deeply integrate regional electricity markets. In coming years, Asia and the world must make a transition from fossil fuels to cleaner forms of energy. This requires long-term thinking and investment of trillions of dollars in new infrastructure. Subsea pipelines represent a long-term solution. FLNG, by contrast, looks like an example of short-term thinking that costs more in the long run. Liquid Natural Gas: Asia’s Climate/Energy Albatross? Is Liquid Natural Gas taking Asia backward in tackling climate change? LNG is a short-lived, inflexible and inefficient transport technology. Natural gas pipelines are cleaner, more efficient, long-lived and flexible. Interconnected pipelines also create more competitive regional energy trading networks. The United States is a prime example. These advantages of gas pipelines lower costs, increase supply security and encourage technological innovation. That’s a lot of advantages. In coming years, Asia needs trillions of dollars of new infrastructure as it emerges as the world’s largest, most dynamic economic bloc. As much as half of this infrastructure need is in the energy industry. LNG represents bad value for Asia. This will become more apparent with every year that goes by. Signs of this are already appearing. Three LNG export plants built in Australia’s Queensland have been plagued by continuously rising costs, environmental damage to the Great Barrier Reef and admissions of construction inefficiencies by their owners. Liquid Natural Gas technology involves transporting highly-compressed natural gas in multi-billion dollar, specially-designed ships. Receiving ports must be equipped with similarly expensive, single purpose infrastructure to decompress the gas for delivery into domestic pipeline networks. This ‘locks in’ high-costs, market rigidities and energy security risks at a time when Asia needs liquid, flexible, innovative energy markets. LNG technology entered the market during the 1970s, when energy import dependent Japan began importing large amounts of natural gas from the Middle East. For very long distances across large oceans (Middle East-Japan, US-Asia, for instance) and, absent alternatives, LNG may make sense. A template to study is North America’s continent-spanning gas pipeline network and Henry Hub clearing price. The North American model’s efficiency has been undeniable in rapidly delivering to market newly-discovered gas supplies at competitive prices while deepening supply security through network redundancy. A huge additional advantage of pipelines is their proven capacity to simultaneously also carry other valuable energy-market freight like biofuels (now being done in Canada’s British Columbia), hydrogen (common in both the United States and Europe) and even waste carbon (soon to be done in America’s Texas). The final nail in LNG’s coffin may be its high greenhouse gas emissions from compressing and uncompressing gas. Once carbon prices are appplied to these, premature writedown may occur of multi-billion dollar LNG assets which can’t adapt to changing markets. Grenatec proposes a Pan-Asian Gas Pipeline network stretching from Australia to China, Japan and South Korea as part of a larger, cross border energy network including High-Voltage Direct Current power lines. The time to start planning the networks of tomorrow is now. That means developing flexible, adaptable, integrated energy production and delivery technologies. A Pan-Asian natural gas pipeline would be more efficient in meeting Asia’s future energy needs than Liquid Natural Gas. In coming years, Asia is slated to spend hundreds of billions of dollars on Liquid Natural Gas infrastructure. The aim will be to ship compressed gas from Australia and Southeast Asia to China, Japan and South Korea. This LNG infrastructure will be short-lived, greenhouse gas-intensive and technologically inflexible. An interconected regional gas pipeline network, by contrast, would last a century or more and carry different fuels over time. In the report, Grenatec argues Liquid Natural Gas represents a major technological ‘wrong turn’ for Asia if economic efficiency, greenhouse gas mitigation, inclusive wealth creation and innovative energy market development are priorities. One sign of LNG’s worsening economics are ongoing cost rises of 10% or more per year for new LNG projects in Asia, particularly in Australia. These cost rises are multiples of the regional inflation rate. In its report, Grenatec outlines an alternative paradigm of a longer-lived, more flexible regional natural gas infrastructure costing the same as the current generation of planned LNG projects in Australia. The advantages compound when electricity and data are added to the networ since a regional gas pipeline would create the pathway for high-capacity power lines and fiber optic cables to be laid alongside. A Pan-Asian Gas Pipeline network may prove more efficient over the long-term than the liquid natural gas infrastructure now planned for the region. Nearly $200 billion of LNG infrastructure is now targeted for Asia. The bulk is aimed at transporting Australian gas to Northeast Asia. This infrastructure would shift roughly 60 billion cubic meters of gas per year from Australia to China, Japan and South Korea. But a similar capacity Pan-Asian Gas Pipeline might be built for $125-200 billion, depending on whether the Pan-Asian Gas Pipeline goes by land or by sea. 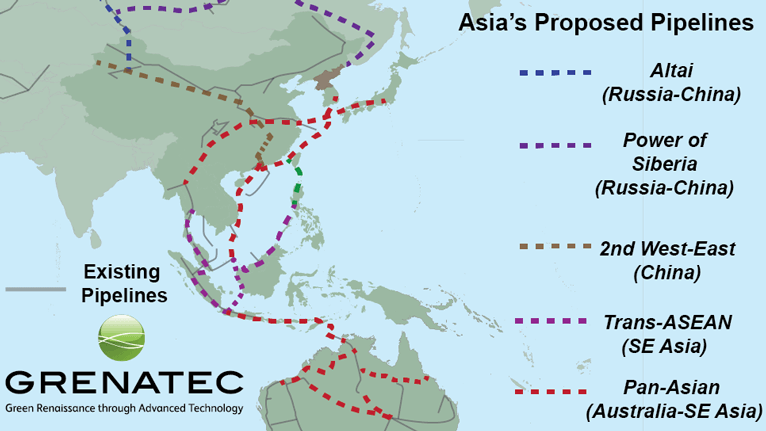 Grenatec’s research finds that an Pan-Asian Gas Pipeline ‘bundled’ with high-capacity HVDC power lines and fiber optic cables may be Asia’s most ‘future proof’ long-term choice. 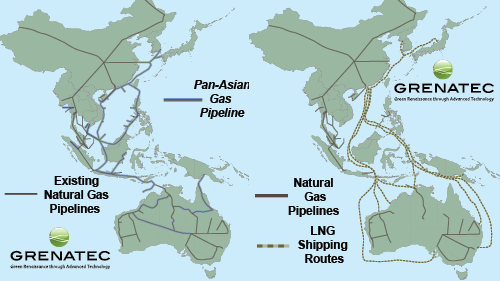 The benefits of a Pan-Asian Gas Pipeline integrated into a Pan-Asian Energy Infrastructure would include enhancing regional economic growth, reducing regional infrastructure expenditure, increasing energy trade, reducing geopolitical tension, lowering geenhouse gas emissions and improving energy market price signals. These efficiencies could be created through building a flexible, interconnected energy and data system stretching from Australia to South Korea. In the past 20 years, the Internet has transformed the global economy by providng a multi-route, multi-purpose, open network for data. It’s now the energy industry’s turn for a similar efficiency revolution. The good news is that preliminary ‘bits and pieces’ of a Pan Asian Gas Pipeline and Pan-Asian Energy Infrastructure are now taking shape. These include the Trans-ASEAN Gas Pipeline, the proposed Malaysia-South Korea pipeline, TheYacheng 13-Hong Kong pipeline, the Timor Sea Bayu Undan pipeline and the proposed Browse Basin-Darwin, Australia Ichthys pipeline. The long-term benefits would be compounded by combining this infrastructure with fiber optic cables and power lines similarly traversing the same routes. Proposed cross-border regional power line projects include the Trans-ASEAN Electricity Grid. Regional fiber optic cable projects underway in Asia include Indonesia’s Palapa Ring, Australia’s National Broadband Network and others. All of the above traverse the same route a Pan-Asian Gas Pipeline would take. Over time, a Pan-Asian Gas Pipeline can transport hydrogen, biofuels and even waste carbon. They have a future economic value that isn’t being properly appreciated in the rush to build single-generation LNG. Asia needs trilliions of dollars of new infrastructure in coming years. The long-term, optimal efficiency of this infrastructure needs to be analysed more fully. The Canning Basin in Australia’s isolated Kimberley may be one of the largest unconventional natural gas finds outside the United States. The Canning Basin represents a key test of Australia’s ability to build the long-term infrastructure needed to develop a future low-emission economy. The Canning Basin’s already set to get a pipeline extension to the regional hub of Broome. The ramifications are immense. In the Canning Basin, Australian junior oil and gas explorer Buru Energy has found highly prospective oil and gas fields. Buru’s now moving ahead to develop these fields. Buru needs a route to market, but Western Australian (WA) law presents a complicating factor. Western Australia law mandates that 15% of any new gas developed in the state must be consumed within the state. This is a populist measure aimed at keeping Western Australia gas prices artificially low through distorting markets. The goal is to attract industry — reflecting misguided views that energy prices alone (leaving out labor costs, distance from markets, etc.etc.) determine investment. To meet this ‘set-aside’ requirement, Buru has agreed to build a $500 million, 600-kilometer pipeline to pump Canning Basinto Port Hedland. (see “Buru on a roll with pipeline deal,” The Australian, Nov. 8, 2012). The gas will then be delivered to state users via WA’s existing pipeline delivery network. Woodside Petroleum wants to build a highly-controversial Liquid Natural Gas plant just north of Broome and Japan’s Inpex wants to develop the Ichthys Field nearby. These are also potentially large sources of new supply. Like Buru, Woodside and Inpex want to sell the bulk of their Canning and Browse gas to China, Japan and South Korea. What emerges is an ideal opportunity to take Buru’s pipeline project between the Canning Basin and Port Hedland, and use that as the first bit of a larger pipeline infrastructure stretching from Port Hedland to Darwin. All of this could create the critical mass for a pipeline system that could subsequently stretch across the Timor Sea, Indonesia, the South China Sea and/or Mekong States enroute to Northeast Asia. The result will be a much more flexible, future-proof pipeline infrastructure. Over time other, more futuristic fuels also could be pumped through the pipeline. These include biofuels, hydrogen and natural gas. And if such a regional pipeline were built, it could be bundled with high capacity power lines and fiber optic cables, creating a triple benefit — not just for Australia, but the region. It’s not often populist lawmakers interfering with the laws of economics createa positive sum outcome. But in WA, that could be the case.